I'm trying out a new feature on The Reading Room this summer called "Throw Back Thursday: Great Books from My Reading Past." I'm still tweaking it a bit, so the name or format might change some, but the purpose will remain the same. There are favorite books that I've read in the past, books that are in different genres, and many of these books are before I started doing reviews or had a blog. But, I so want to share them with my book friends and the reading community that it only makes sense to use my blog to do so. I plan to start out sharing a book every Thursday, as summer is a busy reading time and suggestions may be appreciated. As I've already noted, these books will be different genres, but they will also be different age groups. I plan on sharing children's, young adult and teen, and adult. To start off this new weekly event, I am excited to bring to you a book that I have recommended to friends over the past ten years. 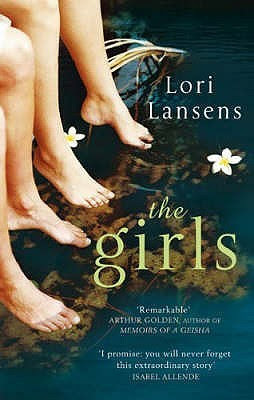 Long before there were "girl" titles popping up all over the place, there was the original "girl" title written by Lori Lansens. Below is a description of The Girls by Lori Lansens. It is a book that so completely surprised me with its impact that I feel to this day it was one of my most important reading experiences. I hope that you will give it a read and love it as much as I do. In Lori Lansens' astonishing second novel, readers come to know and love two of the most remarkable characters in Canadian fiction. Rose and Ruby are twenty-nine-year-old conjoined twins. Born during a tornado to a shocked teenaged mother in the hospital at Leaford, Ontario, they are raised by the nurse who helped usher them into the world. Aunt Lovey and her husband, Uncle Stash, are middle-aged and with no children of their own. They relocate from the town to the drafty old farmhouse in the country that has been in Lovey's family for generations. Joined to Ruby at the head, Rose's face is pulled to one side, but she has full use of her limbs. Ruby has a beautiful face, but her body is tiny and she is unable to walk. She rests her legs on her sister's hip, rather like a small child or a doll. Rose has always wanted to be a writer, and as the novel opens, she begins to pen her autobiography. I have never looked into my sister's eyes. I have never bathed alone. I have never stood in the grass at night and raised my arms to a beguiling moon. I've never used an airplane bathroom. Or worn a hat. Or been kissed like that. I've never driven a car. Or slept through the night. Never a private talk. Or solo walk. I've never climbed a tree. Or faded into a crowd. So many things I've never done, but oh, how I've been loved. And, if such things were to be, I'd live a thousand lives as me, to be lovedso exponentially. Ruby, with her marvelous characteristic logic, points out that Rose's autobiography will have to be Ruby's as well — and how can she trust Rose to represent her story accurately? Soon, Ruby decides to chime in with chapters of her own. The novel begins with Rose, but eventually moves to Ruby's point of view and then switches back and forth. Because the girls face in slightly different directions, neither can see what the other is writing, and they don't tell each other either. The reader is treated to sometimes overlapping stories told in two wonderfully distinct styles. Rose is given to introspection and secrecy. Ruby's style is "tell-all" — frank and decidedly sweet. birthday is suddenly impossible to answer. Lori's most recent book is The Mountain Story (June 2015), and it is a powerful, amazing read, too. I highly recommend it. For information about Lori Lansens and her other books, you can access her Web site at http://lorilansens.com/ She doesn't publish a book often, so you have plenty of time to catch up on her books until the next one.